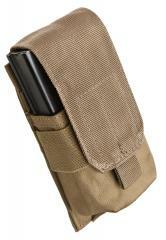 An affordable single magazine pouch for two M16 magazines. The adjustable and removable flap makes this able to take longer mags as well. 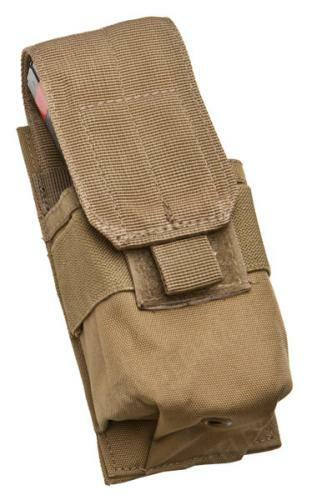 Although we would not recommend these for any actual military/law enforcement use, they work well enough in airsoft or paintball. In addition to which these are very reasonably priced. 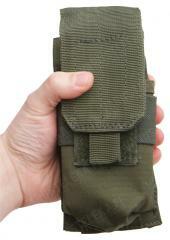 MOLLE attachment on the back, drainage holes at the bottom. Made entirely of polyester. * You can fit 2 magazines inside, but the fit is very tight. Putting them back inside in a hurry is not feasible, but a dump pouch will sort this problem out. 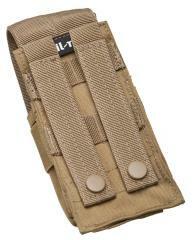 Factory new, made by Mil-Tec.